Price: $29.99 for a limited time; $49.99 after. Highland 1.0 was a text editor built around Fountain | A markup language for screenwriting..
Highland 2 adds Markdown to its considerable Fountain skills to make it an unique addition to your text editing tools. 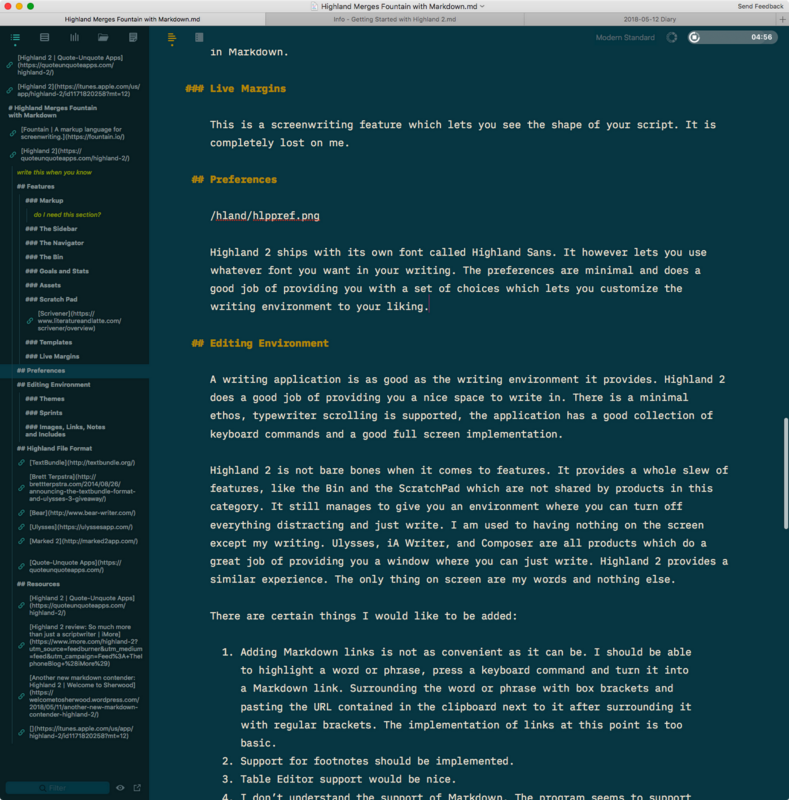 Highland 2 is a complete writing environment for both Markdown and Fountain based writing. I will write about the features which are interesting to me. I don’t write screenplays. That is not my focus for this app. I am sure there are people more qualified than me to talk about Highland 2 and its implementation of Fountain. I will deal with the Markdown implementation of Highland 2 and that will be my focus. The support of Markdown is extensive but it doesn’t support all the features of the advanced variants of the Markdown syntax. Explicit support for one of the established variants would be welcome. From what I can tell, it has full support for Fountain. I should be able to fold sections, letting me focus on sections of the document. Should be interactive to the extent that I can drag and drop the various sections to where I want them to be. MultiMarkdown Composer v4 does a great job of this. These two changes would make the Navigator perfect. The Bin is a repository of blocks of text. You can park blocks of text here which you are going to use later in the document. You drag and drop text into it. It is an interesting addition to a single document based text editor. Lets me write stuff and then put it in the bin. I know that it doesn’t fit the flow at this point but I can use it later. Thanks to the Bin, sections I write don’t have to be rewritten because I deleted them earlier. You can set a Word Goal for a document. The word counts and reading time associated with your document. This reminds me of Ulysses and its attempt to create a visual indicator of how you are doing with your productivity. It is an interesting feature and helps those of us who write to a schedule. This is a feature which is a part of the .highland document format that Highland 2 introduces. You can drag media elements like images into the document and the whole collection is a part of the .highland document. The text document and the collection of media elements all get included in what is effectively a zipped archive file. The Assets panel shows all the items you have imported into the document. This is a feature I miss when I write in the Markdown based text editors. Scrivener has a great implementation of this. I am glad to see Highland 2 bring it to the Markdown based text editors. The Scratch Pad is for your random thoughts while you are writing your document. You can put notes in your document using the Highland 2 syntax of circling the section in two box brackets. If what you are writing is long and distracting to the flow of your document you are better off writing it in the Scratchpad. I use it to consider alternate directions and alternate constructions of the argument I am making. Just helps me think through the argument. I love having it implemented in a single document based writing application. A feature useful to those producing content other than for the Web, Highland 2 includes 10 PDF templates to lay out your document and export it. There are some specific to the act of screenwriting and there are some for writing in Markdown. This is a screenwriting feature which lets you see the shape of your script. It is completely lost on me. Highland 2 ships with its own font called Highland Sans. It lets you use whatever font you want in your writing. The preferences are minimal and does a good job of providing you with a set of choices which lets you customize the writing environment to your liking. A writing application is as good as the writing environment it provides. Highland 2 does a good job of providing you a nice space to write in. There is a minimal ethos, typewriter scrolling is supported, the application has a good collection of keyboard commands and a good full screen implementation. Highland 2 is not bare bones when it comes to features. It provides a whole slew of new to the category features, like the Bin and the ScratchPad. It still manages to give you an environment where you can turn off everything distracting and just write. I am used to having nothing on the screen except my writing. Ulysses, iA Writer, and Composer are all products which do a great job of providing you a window where you can just write. Highland 2 provides a similar experience. The only thing on screen are my words and nothing else. Adding Markdown links is not as convenient as it can be. I should be able to highlight a word or phrase, press a keyboard command and turn it into a Markdown link. Surrounding the word or phrase with box brackets and pasting the URL contained in the clipboard next to it after surrounding it with regular brackets. The implementation of links at this point is too basic. Support for footnotes should be implemented. I don’t understand the support of Markdown. Highland 2 seems to support some of the advanced features of Markdown but not all of them. It needs to support a variant: either CommonMark or MultiMarkdown. But support it fully. Not parts of it. I like the fact that Highland 2 ships with themes but I would like the ability to add my own themes. One of the things I find interesting about Highland 2 is that themes are document specific. Usually themes are implemented as a global default. You set the theme and it is valid for all documents from that point on. Not so in Highland 2, individual tabs can have specific themes applied to them. There is no global setting. Highland 2 lets you set and track focused writing sessions. Enter your desired sprint time and go. Highland 2 keeps track of the sprint date, duration, and words added or deleted (for editing sessions). This is record keeping which is again not shared by its competitors. I like it. Forces me to concentrate and be productive. The very act of measuring my progress makes me less eager to welcome distracted. Links and Notes are available when you write in Markdown. Images and included text files are available to you if you adopt the .highland file format. The ability to convert links between inline links and reference links is much appreciated. The notes are very well implemented and a great addition to the workflow. Surround your note with a couple of square brackets and the notes show up in the Navigator. An useful implementation of the feature. I find myself using more notes than I thought I would. The .highland document is a customized TextBundle file. It is a compressed .textbundle file. I was very excited when TextBundle was introduced by the “mad genius” Brett Terpstra and the Ulysses folks. The adoption of the format however has been pretty slow. The three programs, I know of, which have adopted the document format are Bear, Ulysses, and Marked 2. Now we have the Quote-Unquote Apps introduce a variant of the TextBundle format. This introduces a lock-in with the Highland 2 application, if you adopt the .highland format for your documents. I am not excited by that. It is easy to export out of the .highland format and it is also very easy to rename the extension to .zip and extract your writing from it. I am happy with the simple Markdown files which are accessible to any text editor. However the TextBundle format and the .highland variant are both useful additions to the arsenal of a person who lives in text files. This is not something that I am going to use regularly but it is something that I can see use cases for. The ability to transfer text files along with the media that it includes in one compact file is going to be useful for a lot of users and I am looking forward to the evolution of the format. Highland 2 is priced at $49.99. For a limited time, it is available for $29.99. The price is implemented through an in-app purchase. It is free to download and use. Paying for HighlandPro gives you access to a bunch of templates, 10 editor themes and the ability to export watermark-free PDF. I am coming to the conclusion that products are designed in congruence with the milieu that developers hail from. For instance, developers who are swimming in code find it difficult to see the benefits of typewriter scrolling. That is why a venerated text editor like BBEdit has not implemented typewriter scrolling in its 25 years of existence. Its developer doesn’t see it. Doesn’t see the need for it. Doesn’t need it for code and that is the milieu he seems to live in. Thus users of BBEdit are deprived of typewriter scrolling and spend their writing lives looking at the bottom of their screens. The world of minimalistic design where the iA.net folks live in makes it possible for them to design a text editor like iA Writer. No font choice. Only a light and dark theme and a blue cursor you chase around the screen. The product design is defined by the world the developers inhabit. Highland 2 is designed by scriptwriters. People who live in the world of writing software and it shows. It is filled with features which make the act of writing efficient. The Navigator, the Bin, the Scratchpad, the Sprint are all features which would be the brainchild of people immersed in writing. You look at these and wonder why someone hadn’t thought of this particular combination of features before. You realize that the product design is a product of immersion into the milieu of writing and specifically creative writing. I must point out that Highland 2 automatically renumbers an ordered list if you decide to change your mind and add an item in the middle. This is so rare that the first time I noticed it did that I had to recheck that it actually did it. Features like this just make me smile when I am using this product. Support for all of a Markdown standard. Ability for the Navigator to be dynamic. Give me the ability to drag and drop sections to rearrange the contents of my documents. Export to html and docx. Highland 2 is recommended heartily.